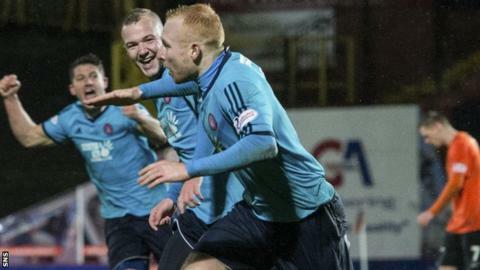 Ziggy Gordon's strike saw Hamilton Academical defeat Dundee United, who are now seven points adrift at the bottom of the Premiership table. After a slow start from the hosts, Billy Mckay opened the scoring. United's profligacy was punished when Gavin Gunning diverted a corner into his own net, though the goal was credited to Lucas Tagliapietra. And Gordon latched on to Ali Crawford's deflected shot to slot the winner and send Accies back into the top six. Hamilton began in confident mood with territorial advantage not producing definitive chances. Their best moment arrived when Carlton Morris ran at Sean Dillon, pulled off a step-over and fired a left-foot shot inaccurately past the far post. It was good work but never threatened Michael Szromnik in goal. The home support seemed anxious as they cowered from some atrocious conditions, fearing another frustrating afternoon's viewing. However, United began to threaten and were soon creating chances with a frequency that allayed the crowd and got them audible. John Souttar drove to the box, slipped a lovely weighted pass into Mckay, who drilled it across goal into the corner. Chances continued to flow as Mckay then released Blair Spittal on the left, but goalkeeper Michael McGovern stayed tall to block well. United were utterly in control now and McGovern had to be alert once more as Mckay swivelled and struck a great left-foot shot from distance that the goalkeeper did well to tip over. Crawford had a free-kick tipped away, but Hamilton's attacks became few and far between. It should have been two for United when Mckay broke into the box with Ryan McGowan right and Spittal left. A ball to Spittal would have surely resulted in a goal, but with McGowan screaming for the ball to go there, Mckay instead fed the Australian and the chance was gone. John Rankin came close with a toe-poke again saved by McGovern. Paul Dixon recycled to the back post, where McKay looked odds-on to score, but McGowan came in, got in his way and the ball was blazed wide. In the second half, United looked comfortable and Mckay spurned another glorious chance to put his side further ahead. He was one-on-one and tried to slip the ball past McGovern, but the goalkeeper again got something on it to keep his side in the game. There was to be a punishing sting in the tail to continue a season of disappointment for United. From a corner, the ball found the net via United defender Gunning with Lucas pressuring. As if that wasn't enough, Hamilton, encouraged by that goal, swiftly went ahead when Szromnik saved Ali Crawford's low effort only to watch in horror as Gordon seized upon it and found the corner perfectly. It was a cruel turnaround for United, who must have felt they would go on to win. Credit to Hamilton for an outstanding, clinical closing period that again reinforces their top-six credentials. Match ends, Dundee United 1, Hamilton Academical 2. Second Half ends, Dundee United 1, Hamilton Academical 2. Christian Nade (Hamilton Academical) is shown the yellow card for a bad foul. Gavin Gunning (Dundee United) is shown the yellow card for a bad foul. Christian Nade (Hamilton Academical) wins a free kick on the right wing. Substitution, Dundee United. Adam Taggart replaces John Rankin. Goal! Dundee United 1, Hamilton Academical 2. Ziggy Gordon (Hamilton Academical) left footed shot from the right side of the box to the centre of the goal. Lucas (Hamilton Academical) is shown the yellow card for a bad foul. Ryan McGowan (Dundee United) wins a free kick on the left wing. Goal! Dundee United 1, Hamilton Academical 1. Lucas (Hamilton Academical) header from the centre of the box to the bottom left corner. Assisted by Ali Crawford following a corner. Corner, Hamilton Academical. Conceded by Ryan McGowan. Corner, Hamilton Academical. Conceded by Gavin Gunning. Corner, Hamilton Academical. Conceded by Sean Dillon. Substitution, Hamilton Academical. Alejandro D'Acol replaces Dougie Imrie. Corner, Dundee United. Conceded by Ziggy Gordon. Second Half begins Dundee United 1, Hamilton Academical 0. First Half ends, Dundee United 1, Hamilton Academical 0.